This Persian tile panel with a picnic scene is part of �Palace and Mosque� at the Kimbell. The first thing to realize about Islamic art is that its practitioners didn�t know they were creating it. Medieval Spanish mosaic builders and Persian carpet weavers may have shared a belief in Mohammed�s teachings, but they certainly didn�t see themselves as part of a common artistic tradition or see their work as governed by their religion. It wasn�t until the end of the 19th century that Western art historians started to think of �Islamic art� as a single entity. Yet the category arose because there were similarities in the art produced by this far-flung, centuries-old empire. With no history of large-scale painting or sculpture, Islamic art expresses itself primarily in architecture and what Westerners call the decorative arts: ceramics, textiles, calligraphy, illuminated manuscripts, jewelry, and metalwork. The designs are often abstract, but contrary to what you might have heard, there�s no taboo against depicting humans. Figurative art simply never became an integral part of Islamic culture, perhaps because the Qur�an (unlike the Bible) is light on narrative, with few stories to be dramatized. The title of Palace and Mosque, the Kimbell Art Museum�s new exhibit of Islamic art, reflects the show�s dual focus on pieces made for religious worship and those made for private aesthetic gratification, whether for caliphs and sultans or ordinary citizens. These gentle, elaborate, supremely beautiful objects will shed light on the culture that brought them into being. 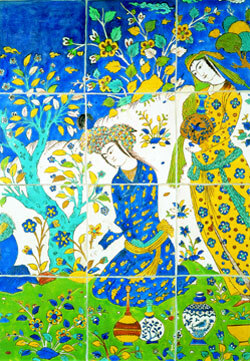 Palace and Mosque: Islamic Art From the Victoria and Albert Museum runs Apr 3-Sep 4 at 3333 Camp Bowie Blvd, FW. Tickets are $2-4. Call 817-332-8451.